We are highly experienced in federal government contracts, understanding Federal Acquisition Regulations (FAR) and Davis-Bacon requirements. We work hand-in-hand with the government contracting officer to ensure an overall successful project. 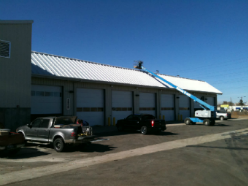 This project was comprised of a 60′ x 80′ 4,800 sq. ft. pre-engineered metal building adjacent to the existing visitor control center at Ft Carson, Colorado. The building is used for training and as such contained classrooms with partitions, administrative spaces, network and communications, restroom facilities, and a mechanical room. As the Prime Contractor, AGC provided scheduling, supervision, quality control, contract management, material purchasing, accounting, and billing. This was an American Recovery and Reinvestment Act (ARRA) project. AGC received a Favorable Contractor rating in the Construction Contractor Appraisal Support System (CCASS) for this project. 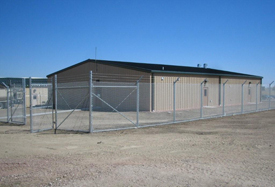 This project for the Colorado Department of Transportation required the simultaneous construction of sand storage buildings at 12 sites, hundreds of miles from one another, in a time frame of 120 days. Each building was ground-up construction with design-build contract elements. Construction consisted of site work, extensive concrete reinforcement, and erection of metal buildings. Rick Strittmater, RKS Structural P.E. 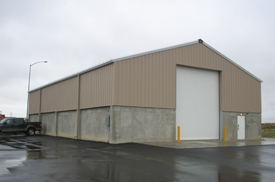 This design-build contract required new construction of an 8-bay vehicle storage facility to include one wash bay, waste oil system, compressed air system, attached 50′ x 80′ sand storage shed with 8′ concrete wall foundation, administrative offices, and restrooms. The construction requirements included mechanical, electrical, and plumbing design including code review, site work and utilities, extensive concrete reinforcement, and erection of pre-engineered metal building finishes. This project was comprised of new construction of a 12,292 sq. ft. fire station completed with related site work, landscaping, detention pond, patio area, and walking trail system. This was a Leadership in Energy & Environmental Design (LEED) project with a sustainability goal of LEED Silver under the requirements of the U.S. Green Building Council. This project was funded, in part, by an American Recovery and Reinvestment Act (ARRA) grant through the US Department of Homeland Security and administered by the Federal Emergency Management Agency (FEMA) and as such, contained additional contract reporting and administration requirements. Aztec, along with the Forest Service Facilities Move Support Team successfully completed 10 major facility moves across the United States including Alaska.